"Go in peace ... this Celebration of the Eucharist has ended." I'm used to hearing "The Mass has ended, go in peace," or something to that effect, but I really liked that Deacon's perspective. big celebration of the Body and Blood of Christ. Something I sometimes take for granted. I like it. Thank you Michael. 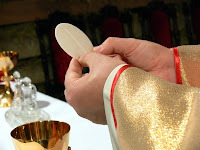 Michael, I think in the deacon emphasizing the celebration of the Eucharist we can be reminded that Eucharist means thanksgiving and should always maintain a grateful attitude in all we do. Great post! Thank you both for stopping by and commenting! Anne, I like your added spin to the Deacon's comment!